The Future Is Now. That Future Is Mobile Intelligence. In a world of big data, the challenges for enterprises to turn information into intelligence that can enhance the customer experience are greater than ever. Add mobile into the mix and those challenges are exponentially increased. But that’s changing quickly. 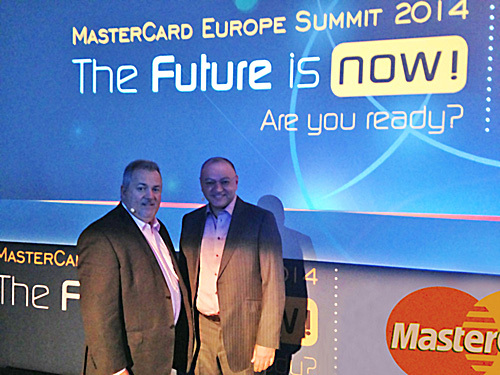 Last week I had the opportunity to present at the MasterCard Europe Summit 2014 alongside MasterCard President of Enterprise Partnerships Hany Fam to talk about how our relationship is helping enterprises leverage new, more effective ways to monetize consumer data from mobile networks. Me and Hany Fam at the MasterCard Europe Summit. Today’s connected consumers are global. They work remotely, connect digitally, travel frequently and always have their connected device within arm’s reach. But while more than 75 million people travel abroad each month, up to 93 percent don’t use mobile services the way they use them at home. When consumers move between countries or even cities, their user experience is often fragmented, disrupted and therefore frustrating. In today’s connected world, the mobile device is the strongest connection a brand can have to an individual. The challenge for enterprises is to find ways to empower the consumer to take advantage of everything that mobile can offer. So how can brands create hyperpersonalized, highly relevant communications that enhance the customer experience and increase engagement? And why is that important? Because when consumers switch off their mobile data, they’re not actively engaged, and that’s lost loyalty and a missed opportunity for the enterprise. Together Syniverse and MasterCard are, for the first time, enabling a convergence of payments and mobile networks on a global level. For enterprises that means a range of opt-in services that ensure a seamless payment and mobile experience for billions of consumers at home and abroad. And that puts the consumer in control and gives peace of mind. For example, a consumer’s payment card location can be linked to the geolocation of her connected device via this relationship. So, if a consumer is traveling with his phone in London and attempts to make a payment transaction, enterprises can use real-time mobile context to validate the location of the consumer’s device and make an informed decision that the transaction is likely legitimate, and therefore authorize the transaction. That means traveling consumers and financial institutions are less likely to encounter the frustrations associated with unqualified payment card cancellations or blocked transactions. And the enterprise can realize cost savings through the reduction of false positive transactions and early intervention of actual improper card usage. Consider the fact that today up to 80 percent of declined transactions are actually legitimate, and that means significant cost savings for the enterprise. This is just one example of how smart businesses are harnessing the power of real-time mobile context to make informed business decisions that ensure better results, increase engagement and enhance the end-user experience. The possibilities are endless, and they’re happening now. To increase customer loyalty and satisfaction, enterprises need to upgrade the mobile experience and deliver real-time, context-driven mobile experiences that empower end users around the world. Alfred de Cárdenas is former President of Global Sales and Service and Chief Sales Officer at Syniverse.